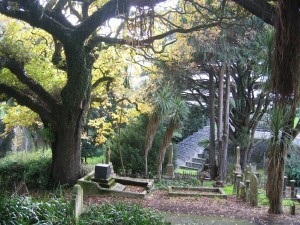 Bolton Street Cemetery in central Wellington, New Zealand, contains the city’s original burial ground, dating from 1840, which encompasses three separate cemeteries. It commemorates many early pioneers and important historical figures from the 19th century. The Friends of Bolton Street Cemetery is a voluntary society which works closely with the Wellington City Council to preserve, protect and develop the heritage aspects of this lovely historic cemetery. Bolton Street Cemetery (known as Bolton Street Memorial Park from 1978 to 2014) is an excellent example of a colonial cemetery, using imported and local stone, iron and wood. Its iron memorials, wooden tablets, picket fences and wrought iron surrounds are particularly significant and comparatively rare in New Zealand. The Chapel information centre on Bolton Street, open from 10 am to 4 pm daily (see Location Map), contains exhibits and has a full burial list of the 8,679 people interred in the cemetery. Situated alongside is the Sexton’s Cottage (not open to the public) which is one of the oldest surviving buildings in Wellington. It is a peaceful sanctuary of cultivated and forested open space. Over 1,300 carved and worn monuments are distributed throughout the Cemetery that straddles the motorway. A nationally important collection of heritage roses, some dating from the colonial era, inter-twine with other early plantings amongst picket fences and wrought iron surrounds. Walkways offer a unique stroll between the city centre and the formal Rose Garden of the Botanic Gardens. Memorial Trail pamphlets at each entrance enable visitors to learn of the notable people who are remembered within the Cemetery. For more information about the Cemetery see History. For information about locating or maintaining gravestones, see Gravestones and for research on family names see Burial List. The Friends of Bolton Street Cemetery are an active group of volunteers whose aims are to preserve, protect and develop the wooded and historic atmosphere of the old cemeteries, to help maintain the graves and to assist in developing the area as an historic cemetery-park. We welcome new members to help in this work, including those who have family commemorated in the Cemetery. See Join Us for more information about the Friends and to become a member.